Nuts: Pepitas a are a kitchen staple for me but you might not have them on hand. Look and see what nut/seed was used in the mole sauce and try to either match or compliment that. Toasted almond slices or pecans would be lovely. Grain Bowl: Really the only thing missing, to make this a dinner, is grains. I could easily make a meal out of this cauliflower mix with the help of quinoa, farro, or millet. Mole: If you don’t feel like trying your hand at mole, you could swap out sauces. I’d recommend roasting the cauliflower in a romesco sauce or a flavorful masala paste. The flavor in this dish is really in whatever you roast the cauliflower in- don’t skip! 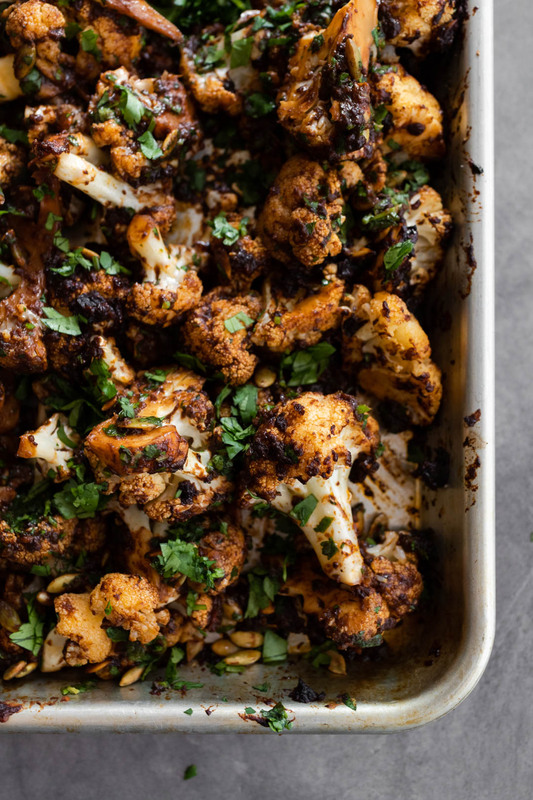 Perfect as a side salad or vegan lunch, this roasted mole cauliflower is full of flavor and easy to make. Heat the oven to 425˚F. Combine the chopped cauliflower with the mole sauce, olive oil, and a pinch of salt. Roast, stirring occasionally, until the cauliflower is tender; 30 minutes or so. While the cauliflower is roasting, place the cilantro on a cutting board and add lemon zest and garlic. Chop until everything is well-combined and minced finely. Once the cauliflower is tender, remove from the oven and stir in the chickpeas (optional), pepitas, cilantro, and lemon juice. Taste and adjust the salt/lemon juice and desired. Serve warm or cold. Tips + Tricks: As mentioned, look for homemade mole at a local Mexican grocery store. If you can’t find any there, make a quick version from a recipe like this or this. Or of course, if you’re in it to win it, make an authentic batch.